Considering that no one in my family is expecting, it might seem strange that I have been so happily perusing a baby name book. 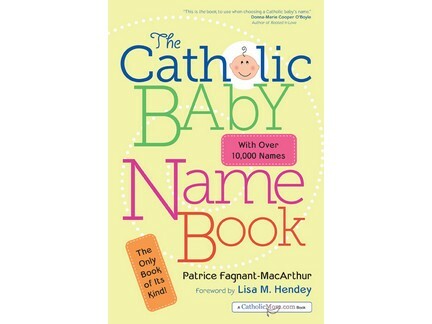 But The Catholic Baby Name Book by Catholic Lane Senior Editor, Patrice Fagnant-MacArthur, is a complete delight and of nearly the same interest whether you are looking to name an expected baby or wanting to know more about the names you have already given your children. 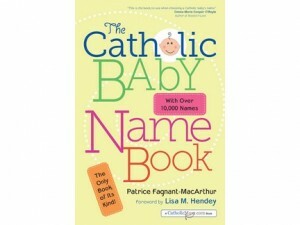 What makes this the right book for naming Catholic babies is the way name meanings and variations are interwoven with quick stories about saints and Bible characters both famous and little-known. Perhaps you already were familiar with the Greek word used in the New Testament for love – agape – the kind of love God shows us and the kind of love we show when we imitate him. But did you know that Agape is also a girl’s name and the name of a saint? I was delighted to learn that my grandson Ethan is named after a cymbal player in the court of King David in the Old Testament. And although I already knew that the name of my deceased daughter, Jessica, meant “wealthy”, I never knew that there was a St. Jessica. In fact, Jessica’s middle name “Faith” is also the name of a saint! It was so comforting to learn that. Every page of this wonderful book contains fascinating tidbits like that. This is the first baby name book I have ever seen that you would be tempted to sit down and read just for the pure pleasure of it. You will want to look up the names of everyone in your family to find more heavenly friends whose aid you can invoke in their behalf. And if a baby is expected in your family, this is the one baby name book you must have. Why name Catholic children after famous people of this world whose way of life is described in such dire terms by St. Paul? “[M]any… live as enemies of the cross of Christ. Their end is destruction, their god is the belly, and they glory in their shame, with minds set on earthly things” (Philippians 3: 18-19). Proverbs 22:1 says, “A good name is to be chosen rather than great riches, and favor is better than silver or gold.” Of course, the way your own child decides to live his or her life will largely determine what kind of name (i.e. reputation) your child ends up with — there is a St. Adolf, for example, though it will probably be generations before that name loses the connotation of horror it gained in the last century — but we give our children a head start in having “a good name” when we name them after good people, giving them a name to live up to rather than a name to live down. St. Paul goes on to remind us “our commonwealth is in heaven” (Philippians 3: 20). It is toward heaven that we should direct the attention of our children, and we can do so even by the names we give them. We can secure for them heavenly friends, helpers, and models of holiness. We can inspire them by naming them after virtues or the gifts and fruits of the Spirit. That is why The Catholic Baby Name Book deserves a place in every Catholic home. I promise: you will just love it!